The train that broke and stalled in midtown today is a stark reminder of the dangers we face from trains carrying explosive oil through Sacramento. Oil refineries in the Bay Area are currently seeking permits to receive explosive Bakken crude and toxic tar sands oil. If successful, we could have six or more 100-car oil trains coming through Sacramento each day. When an oil train explodes, the fireball can be up to 900' and the evacuation zone is at least a mile. The minor incident this morning caused great confusion and disruption of downtown. Imagine what would happen if it had been an explosive 100-car oil train. In Sacramento, a quarter of a million people live within the evacuation zone. Sacramento City Unified School District alone has 17 schools with 13,000 students within that zone. A government report predicts about 10 major incidents each year as the oil train infrastructure builds out. This is unacceptable risk. Bakken crude and tar sands bitumen is considered extreme oil because it is extracted by high energy-intensive means. It is commonly shipped in rail cars that were not designed to carry hazardous materials over tracks that have not been used for this much weight in some very sensitive areas of California—through cities and towns, over bridges, and along major waterways, including the American River. Benicia and San Luis Obispo City Councils are expected to make their decisions this month on whether to grant permits to allow oil refineries to receive rail shipments of explosive oil. 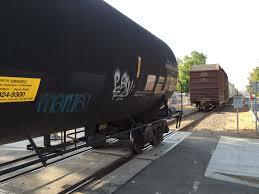 If the permits are granted, oil trains will come through Sacramento daily. 350 Sacramento is working with other organizations in Sacramento and throughout the country to stop these dangerous oil trains. They are too dangerous. We were lucky this time. 350 Sacramento is a local grassroots organization working to address climate change. Learn more at http://www.350sacramento.org or info@350sacramento.org.